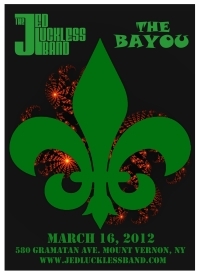 The Jed Luckless Band returns to their local watering hole for some tasty jams and cajun food! Kicking of their 2012 Spring tour with a bang, the band launches into their first “Shakedown Street”, jamming their way into the pop original “Still In Luv With U.” The Talking Heads tune “Cities” returns to the setlist, with K-man belting out the vocals. The first set also includes a real nice “Sugaree,” a powerful VOTR and a fun “Bouncing” for the Phish fans. Second set features a 20+minute Saw Mill/NFA/Freeze combo, where the band really cranks out some nice Dead-y jams. A sweet “Dear Prudence” and a bouncy “Franklin’s” round out the set, with a nod to The Boss in the encore slot.